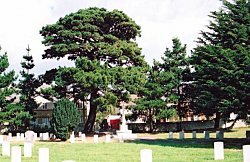 During the late evening of the 23rd December, 1916 Private Francis Thomas McQuirk of the Australian Army Medical Corps was struck by a motor car on the Chickerell Road near the Marquis of Granby public house. He was seriously injured and died two days later in the hospital at the Montevideo Camp where the 2nd Australian Command Depot was based. A court of enquiry was held at the Montevideo camp on the 26th December by order of the commanding officer into the death of 716 Private Francis Thomas McQuirk. The Presiding officer was Captain B. Sampson, 15th Battalion, AIF assisted by Lieutenant G. Rockwood, 1st Battalion, AIF and 2nd Lieutenant W.D. Lawrie 14th Battalion, AIF. A signed statement by Frederick Sturmey informed the court that he was a licenced motor driver employed by Puffets Garage of Westham and that on the night of the accident he was driving taxi cab FX 1923 from the Australian camp to Weymouth. At about 1015 p.m. he was some 30 yards past the Marquis of Granby Inn when he saw a man jump out from the footpath in front of his car and waving his hands. The car was travelling at 12 mph and he managed to swerve, braked but struck the man and knocked him down. The car skidded for about 3-4 yards before stopping. On getting out of the car he found a man lying underneath moaning about his legs. Helped by some passing soldiers they lifted the car and pulled the man clear. Badly injured they put him into the car and drove to the hospital hut at Montevideo Camp. The next witness was Hubert Kidson, who was an apprentice at Whiteheads Torpedo Works. The driver, and himself were the only occupants in the car when the accident happened and his evidence confirmed the statement of the driver. Private H. Moore of the 18th Battalion, AIF told the court he was returning from Weymouth to the camp on foot and had passed a man at the Wyke road junction who was crossing over towards the footpath. Although sober the man appeared to be limping. Then a motor car passed by him and shortly afterwards he heard a cry. Turning round he saw the car stationary, ran back about 30 yards and saw a man lying underneath the car groaning with pain. He and a group of passing soldiers lifted the car and dragged the man out from under the car. The injured man was put into the car and he was driven to the camp. Moore walked back to the camp and on arrival reported the incident at the guard room. Two other witnesses, soldiers who had helped at the scene of the accident confirmed the previous statement made by Private Moore. They added that when the injured man arrived at the camp he was placed on a stretcher and taken to the hospital hut. Another witness, Private H. Palmer of the 1st Australian Pioneers had accompanied the injured man in the car. On arrival at the camp he sent a man to the Dispensary Hut for a stretcher and a medical orderly who took charge of Private McQuirk. Lance-Corporal J. Hammons a medical orderly of the 15th Battalion, AIF stated that at about 11 p.m. on the 23rd December, he was asked to go and attend on man that had been run over by a car. When he got to the Dispensary Hut he recognised the man as Private McQuirk of the Medical Staff and immediately sent for the doctor. Captain J. Norris, AAMC, a doctor, informed the court that when he arrived at the Dispensary Hut he examined Private McQuirk and diagnosed that he had a fractured spine, legs and ribs. After giving him treatment he was taken to the camp hospital. Called out twice during the night the doctor was of the opinion that McQuirk's condition had become critical. He remained conscious until a few minutes before his death on the 25th December. The deceased gave no indication to the doctor as to who was responsible for the accident. The conclusion of the court of enquiry was that the injuries sustained by Private Frank McQuirk were the result of a motor car accident and there was no evidence to suggest that the driver was to blame. They were satisfied that McQuirk was not under the influence of alcohol and that he was not in the performance of his military duties. The Commanding Officer of the 2nd Command Depot, Colonel R.S. Browne C.B., V.D., concurred with the findings of the court of enquiry. He signed the report document on the 29th December, noting that action was being taken by the police to ascertain the age of the driver of the car. Francis Thomas McQuirk was born at Orsett, Brentwood, Essex c.1876 the son of Thomas and May McQuirk. There is little evidence about his early education but he served for a short period with the 1st Volunteer Essex Artillery, before the family emigrated to Australia. Prior to the outbreak of the First World War he married his girlfriend Amy and subsequently they had two children. They resided at 54 Cross Street, Double Bay, Sydney and later at No.6 Colonel Braund's Crescent, Daceyville, Sydney, New South Wales. Francis enlisted into Australian Army Medical Corps at Double Bay on the 9th October, 1914 and was described as being 5ft 5ins in height, weighed 115lbs, chest 36-ins, with brown eyes, brown hair, and a fair complexion. He gave his trade as that of an ex-steward and religious denomination as Church of England. On the 28th November, 1914 he embarked at Sydney on HMT Kyarra for Egypt and was posted to the 2nd Australian Hospital. In September 1915 he was transferred for duties with the Transport Service and sailed from Suez on the Hospital Ship Ascanius on the 7th and docked at Melbourne on 4th October, 1915. Re-assigned, he was returned to general medical duties with the 2nd Australian Division and embarked from Melbourne for Egypt in January on HMT Oriana. On the 21st March, 1916 he sailed from Alexandria for France and was based at the 2nd Australian Division Base Depot at Etaples. Whilst there, he was confined to barracks for seven days for 'disobedience'. In July 1916 he was admitted to the 26th General Hospital at Etaples with Myalgia - muscular rheumatism - and invalided on the 21st to the United Kingdom on the Hospital Ship Newhaven from where he was admitted to the 1st General Hospital at Cambridge. Discharged from there he was posted to the 2nd Australian Contingent Command Depot at Weymouth. Troubled again by Myalgia he was re-admitted to the hospital at Cambridge. On discharge, a few weeks later he returned to Weymouth. The Coroner for South Dorset Mr G.P. Symes held an inquest at the Guildhall, Weymouth on the 28th December into the circumstances which led to the death of Private McQuirk. He explained to the jury that the deceased had been knocked down by a motor car and fatally injured. There were two issues the jury members would have to take into consideration in reaching their verdict. Firstly, there was no witness who actually saw the accident and that the deceased was unable to give a clear account of what had happened. 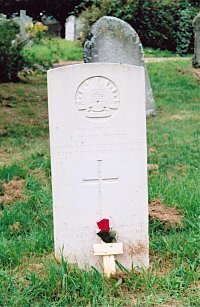 Private Harry Moore was the first witness who told the coroner that at about 2200 hours he was returning to camp on foot along the right-hand side of the Chickerall Road. He passed a man who had crossed over from the Wyke road. A few minutes later a motor car passed him coming from the direction of Montevideo camp towards Weymouth. He then heard a loud scream, turned around and ran back to the car, shouting that the driver had struck the man. Although it was dark he could see him lying underneath the car. Unable to lift the car himself - there were two people still in the vehicle - some passing Australian soldiers assisted and they lifted the car and got the injured man out from under the car. They put him into the car which returned to the camp. Asked by the Coroner if he had heard the car sound its hooter, witness replied he could not remember. He added that he thought the car was not speeding and the driver had said to him that the injured man was drunk. Dr Norris AAMC informed the Coroner that he had been called to examine a man who had been brought into the camp dispensary. He quickly established the man was seriously injured with a fractured spine, limbs and ribs and there was little chance of him surviving. There was nothing to indicate that he had been drinking and the doctor had known McQuirk in Egypt and found him to be a steady man. Although he remained conscious he died just before 0600 hours on Christmas Day. Lance Corporal Farrow AAMC, said that he had known Francis McQuirk having come over with him from Australia. He was a married man with two children and had never seen him drunk. When he had arrived at the camp dispensary McQuirk was in pain and they administered morphine. Although drowsy he told Farrow that he had been hit by fast moving car. McQuirk then appeared to fall asleep and began to vomit. There was no trace any drink. Captain C. Pitt-Rivers the chaplain, had spoken to the deceased who appeared to be rational but was confused and could not give a lucid explanation of what had happened to him. He did remember that the car gave no warning and he may have overbalanced near the roadside and was struck by the car. Before the driver of the car Frederick Sturmey gave evidence the Coroner told him that he did not have to say anything that might incriminate him. Sturmey who was 17 years of age said he was willing to give evidence. Employed by Mr Puffet a garage owner as a taxi driver he had held a licence for three months. The car was a small green open Humber and he had been taking soldiers from Weymouth to the Montevideo camp. With him was his 16 year-old friend Hubert Kidson. They were returning to Weymouth and had passed the Marquis of Granby at 12 mph in top gear on the left-hand side of the road, when suddenly a man leapt out from the footpath just a few feet in front of the car. He swerved, braked and sounded the hooter but hit the man who threw his arms into the air. The car's sidelights were on but could not be seen from a distance of more than 20 yards. The Coroner expressed the opinion that the driver was going along at a dangerous speed at 12 mph - 5 or 6 mph was much safer! A policeman who gave evidence said the young witness did not know what he was saying. The car lights could be seen from a far longer distance than the driver stated. Asked about his age, Sturmey said he had applied for his licence and shown a vaccination certificate to verify his age, but since then he was unable to find it. He was allowed to take four men in the car and they each paid him 6d. No one had made any complaint against him and he had not been involved in any accidents. Hubert Kidson confirmed Sturmey's statement and said he had seen the man leap off the path and start to run across the road. The driver had swerved but was unable to avoid knocking the man down. Mr Symes told Sturmey that he should have reported the accident to the Police. If the man had survived no one would have known anything about it. The police informed the Coroner that they would check the age of the driver and if under 17 would prosecute him. In summing up the Coroner thought that when applying for a driver's licence a birth certificate should have been produced. The driver lacked adequate training and all cars should be fitted with a speedometer and adequate lighting. He directed the jury that they could not attach any culpable blame to the driver. The jury returned a verdict of "Accidental Death". 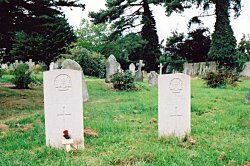 Francis McQuirk died from injuries sustained in a car accident on the 25th December, 1916 aged 48 years and was buried on the 29th with full military honours in Melcombe Regis Cemetery, Weymouth. Grave Location: Section III, Row C, Grave No.2676. Mrs May McQuirk was notified by a Defence Cablegram on the 26th December 1916 that her husband had been involved in a car accident and died from his injuries at Weymouth. She later received his personal effects sent from the Australian Imperial Force Kit Store based at 110 Greyhound Road, Fulham, London. a) Amy Elizabeth McQuirk 54 Cross Street, Double Bay, Wife - Granted Pension of £2 per fortnight as from 1st March 1917.
b) Christopher McQuirk, 54 Cross Street, Double Bay, Child - Granted Pension of £1 per fortnight as from 1st March 1917.
c) Doris Amy Kathleen, 54 Cross Street, Double Bay, Child - Granted Pension of 15/- per fortnight as from 1st March 1917. In July 1922 Mrs McQuirk received her husband's 1914-15 Star, British War Medal 1914-1920, Allied Victory Medal 1914-1919, Bronze Memorial Plaque, Memorial Scroll and "Where The Australians Rest" pamphlet. Private Francis McQuirk's name is inscribed on the Australian War Memorial, Canberra ~ Panel No.183. Newspaper ~ Southern Times 30th December, 1916.